German physicist Arnold Sommerfeld revised Danish physicist Niels Bohr’s model of the atom (discussed in Chapter 10) in 1915. 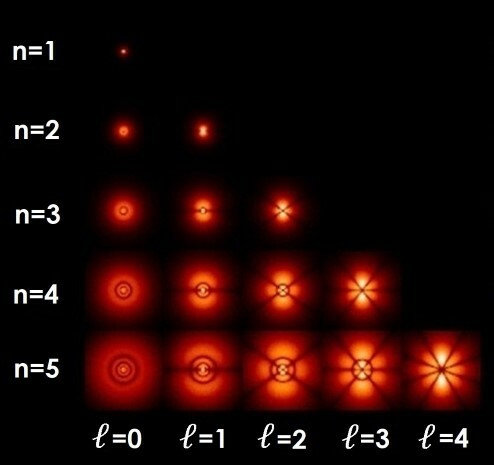 [1,2] Sommerfeld showed that another number is needed to describe electron orbits, besides the shell number (n). This is known as the azimuthal quantum number (ℓ). The azimuthal quantum number describes the orbital angular momentum of an electron, which defines the ‘shape’ of the orbit. Hydrogen atom electron orbitals (for magnetic quantum number m = 0). This means that 2 electrons can have the ℓ = 0 (also known as the s-orbital) shape, 6 can have the ℓ = 1 (p-orbital) shape, 10 can have the ℓ = 2 (d-orbital) shape, 14 can have the ℓ = 3 (f-orbital) shape, and so on. Figure 11.1 shows the possible shapes that electron orbits can take in the first five electron shells. In 1920, Sommerfeld realised that another number was needed to describe the orbit of electrons. [3,4] This is because the current model could still not explain the Zeeman effect (discussed in Chapter 7), the splitting of spectral lines in the presence of a magnetic field. This means that the ℓ=0 shape has one m value, which is designated 0. The ℓ=1 shape can have up to three different m values, which are designated -1, 0, and 1, the ℓ=2 shape can have up to five different m values, which are designated -2, -1, 0, 1, and 2, and so on. Possible orientations for the first four orbital shapes are shown in Figure 11.2. Different orientations of the first four orbital shapes. A magnetic field causes electrons of the same energy, which would otherwise produce a single spectral line, to have different energies depending on their orientation with respect to the magnetic field. In the case of a cloud of hydrogen atoms, the transition from the second to first shell produces three lines as about 1/3 gain energy, 1/3 loose energy, and 1/3 are unaffected by the presence of the magnetic field. This explained the normal Zeeman effect. Sommerfeld was still unable to explain the anomalous Zeeman effect. This is a term used to describe spectra that split into more than three lines in the presence of a magnetic field,[6,7] and is more likely to occur in lines made from atoms with an odd number of electrons in their outer shell. This meant that many still did not accept that electrons have orbits that are defined by quantised positions and directions in space. British physicist Paul Dirac would later explain the anomalous Zeeman effect using another quantum number, s (discussed in Chapter 12). ↑ Sommerfeld, A., Sitzungsberichte der Königlich Bayerischen Akademie der Wissenschaften Matematisch-physikalische Klasse 1915, 1, 425–45. ↑ Sommerfeld, A., Verlagd. KB Akad. d. Wiss 1915. ↑ Sommerfeld, A., Naturwissenschaften 1920, 8, 61–64. ↑ Sommerfeld, A., Annalen der Physik 1920, 368, 221–263. ↑ Zeeman, P., The Astrophysical Journal 1897 (1896), 5, 332–347. ↑ Landé, A., Zeitschrift für Physik 1921, 5, 231–241. ↑ Forman, P., Historical Studies in the Physical Sciences 1970, 2, 153–261.